1 of 1 Cook bucatini following pkg directions. Drain, reserving 1 cup cooking water. Meanwhile, heat oil in a large nonstick skillet over medium-high; add mushroom blend, onion and garlic. Cook 5 minutes, stirring occasionally. Stir in tomatoes, peppers and salt; simmer 5 minutes. 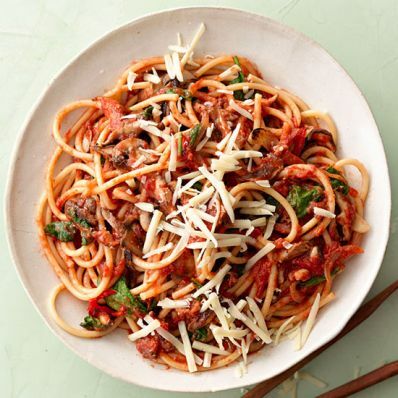 Toss bucatini with tomato sauce and stir in spinach and 1 cup cheese. Add reserved cooking water to thin sauce, as needed. Serve with 1/2 cup cheese sprinkled over top.